A small mod that fixes the derpyness of the dropped items from Paintings and Item Frames when they are broken. 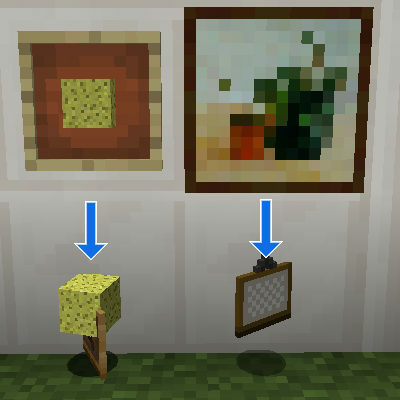 Basically this mod adjusts the position of the dropped items so that they are not inside the wall behind the Painting/Item Frame, and it also removes the horizontal random motion from the dropped item. Note: The mod is only needed on the server side. Re-hosting the mod file otherwise is not cool, mmkay? I remember using your mod back then when these items kept flying into walls on their own. Thanks for making it and even updating it for the small difference it now gives. To be honest, I won't use it for the small difference it gives, just to reduce to mod count by one. But I'm grateful for the use it had before the 1.9 fix since this was really annoying. Thanks ! If this was fixed in 1.9, is the mod still necessary for 1.12? Not really. It does remove all the random motion from the dropped items so that they drop straight down, but that's a fairly minor detail. But since the mod is so tiny and easy to port, I've been keeping it updated to new MC versions anyway, for that small difference. Awesome. Thank you for the quick response, and for continuing to maintain the mod! Hey, since 1.9 fixes it while retaining the slight random motion, do you think you could make a version for 1.7 and 1.8 which still fixes the positioning, but keeps the random motion? It just feels a bit less Minecraft-y without it. It's still worth losing for the fix, but it would be nice to have back. I haven't had 1.7 or 1.8 development environments set up for a long time anymore, and I'm also trying to stop supporting MC versions older than 1.12 in general, unless there is some critical bug found in some of my mods. So this is unlikely to happen, sorry. This is a great bug to have fixed! Thank you! Now I can use item frames without fearing losing the item when I try to take it out. Yay! It never occured to me that this might be fixable with a forge hook. Nice work! Well... there is still the tiny difference that this mod removes the horizontal motion too. But I'll add a note to the description that this mod is now mostly unnecessary in 1.9.